LAKEVIEW — A "creepy" doll's head encased in cement inside a workshed at the Bill Jarvis Migratory Bird Sanctuary has been identified as a Hugga Bunch. That's according to Travis Manney, Online Editor for DOLLS magazine — a publication devoted to the collectible doll industry — plus numerous commenters on DNAinfo Chicago's Facebook page after a story about the doll was posted Monday. Hugga Bunch was a doll line that was jointly created by Kenner Products and Hallmark in the mid-1980s. The dolls came in assorted plush colors and hair colors, Manney said. 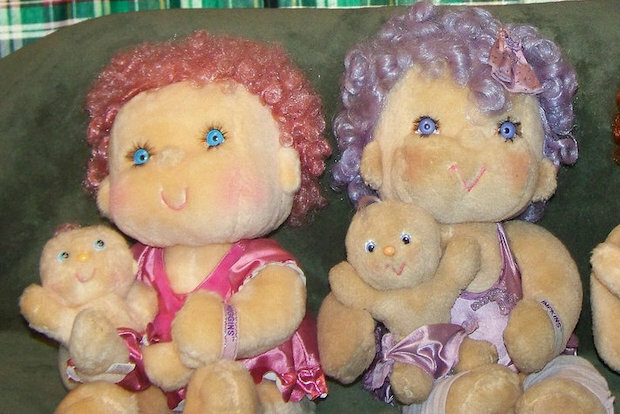 The dolls, which were packaged with a smaller-sized "Huglet" companion, even inspired the made-for-TV movie "The Hugga Bunch." The 1985 film, which won a Primetime Emmy, followed a girl who traveled through a mirror into HuggaLand "to find a way to keep her grandmother, the only one who knows how to hug, young." The doll encased in cement at the Bill Jarvis Migratory Bird Sanctuary has been identified as a Hugga Bunch doll from the 1980s. Most of the Hugga Bunch dolls currently sell for less than $50 on eBay, although ones in sealed boxes go for more than $100 online. Kenner, most well-known for creating a line of "Star Wars" action figures, went defunct in 2000 after it merged into Hasbro toys. An adminstrator from Hallmark's Facebook page said: "Without seeing the product in its entirety with tags, we cannot visually confirm or deny that it is a Hugga Bunch doll from the picture. We are sorry we cannot be of more assistance." 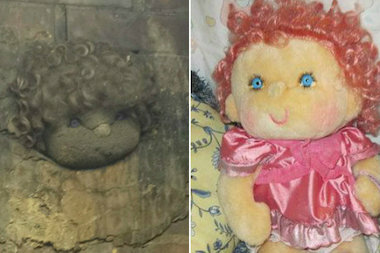 The doll's head sticks out of cement that was used to patch a larger brick wall. The only part of the cloth doll that can be seen is its blue-eyed face and some of its curly hair. "That's just the creepy doll," said sanctuary steward and longtime activist Charlotte Newfeld of Lakeview. Newfeld said that none of the 200-plus volunteers, who work at the 10½-acre sanctuary at 3550 N. Lake Shore Drive two Saturdays a month, knows how the doll got to its perch several feet off the ground. The shed is owned by the Chicago Park District and is attached to a storage area. Its history dates to at least the 1930s, according to Park District historian Julia Bachrach, who added the shed originally was more of a "shack." Bachrach didn't know when the doll might have been encased in the wall. She said she did not have a history of the shed's upkeep, adding, "I doubt there is much documentation on this type of thing." The doll can't be seen by the general public. Only Newfeld and the volunteers have access to the shed. Newfeld said she first saw the doll in "1998 or 1999," when the shed was dilapidated and had holes in its roof.